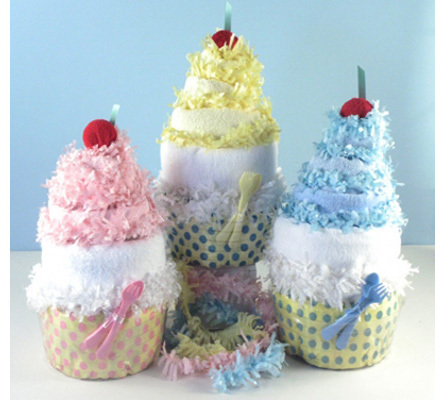 These great looking cupcakes are a terrific alternative to the traditional diaper cake baby gift. Sweet as sugar and made with quality ingredients, our Diaper Cupcakes are great to give as a newborn baby gift or baby shower gift. They come in three delicious favors and are baked to order right here in the USA. 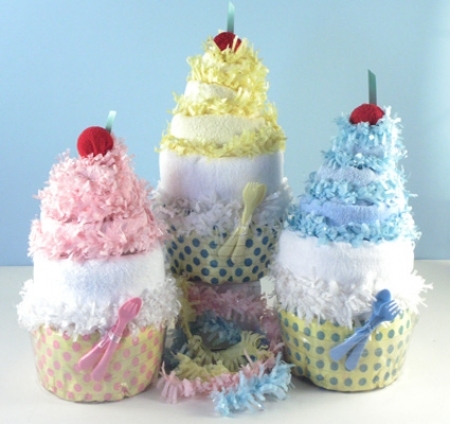 Diaper Cupcake ingredients include: 6 newborn diapers soft & cuddly baby blanket 2-terry burp cloths rerry washcloth fork & spoon and a surprise inside filled with bear toy, terry bib, pacifier, and more!